Where Can I Anchor A Spectator Boat? New River Cut – South of the turn at Bahia Mar. Western portion of Lake Santa Barbara – this is where the parade turns around. The New River will have no anchor zones and will close for boat traffic at 2:30 p.m. The other parade no anchor zone is Birch State Park. We will be working with many law enforcement agencies and will also provide “control boats” (civilian boaters that have attended safety traning and information seminars regarding the parade). • 5:20 PM – The Intracoastal Waterway will be closed SOUTH of Oakland Park Blvd. 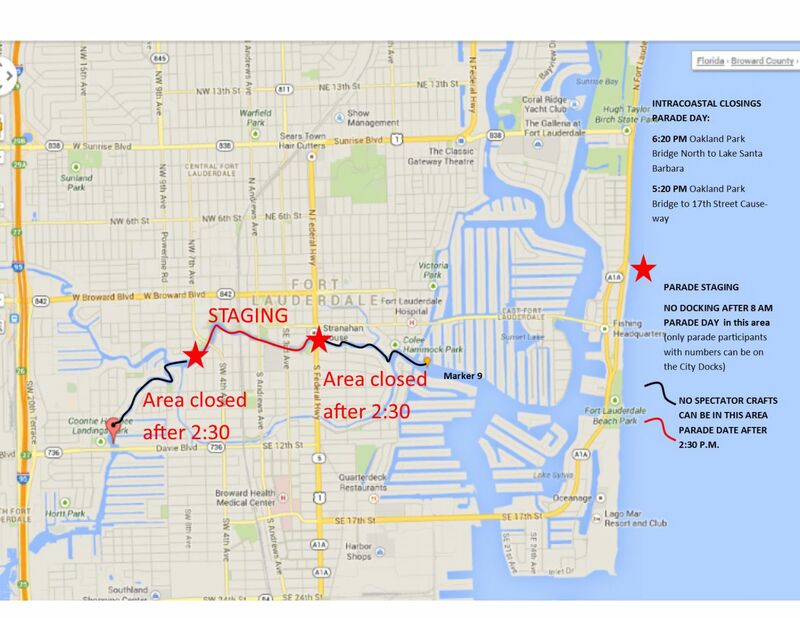 • 6:20 PM – The Intracoastal Waterway will be closed NORTH of Oakland Park Blvd. REMEMBER YOU CANNOT ANCHOR IN FRONT OF A CONTROL BOAT – but a control boat can anchor IN FRONT of your vessel if needed.